A representative for CGI Federal, the prime contractor working on the federal government's trouble-plagued insurance exchange website, told federal lawmakers Thursday that she was confident consumers will be able to successfully enroll for coverage on the HealthCare.gov website by the key Dec. 15 deadline. Changes in the batting order of functions accessible by visitors to the website, such as enabling consumers to shop for health plans before fully registering, were made just weeks before its Oct. 1 launch date, according to developers' testimonies before the House Energy and Commerce Committee. Full “end-to-end” testing of all of HealthCare.gov's many component parts and connections as one integrated whole also was delayed until just weeks before its rollout, witnesses said. House lawmakers, in a hearing that lasted more than four hours, shone a spotlight on the lead contractors hired to work on the website that is the heart of the disastrous first few weeks of open enrollment in the 36 states where the federal government is running the exchange. Cheryl Campbell, senior vice president of CGI Federal, a subsidiary of Montreal-based CGI Group, said in her opening comments that CGI went through eight technical reviews before the system went live Oct. 1 and delivered the "functionality" that the CMS required to allow consumers to enroll. But she also acknowledged that issues with the website have made it difficult for consumers to navigate and that her company quickly shifted from focusing on software development to optimizing performance for users. Later, during the question-and-answer period, Campbell said the health plan shopping and enrollment system is steadily improving every day and that her company continues to review system logs, fine-tune servers, analyze code for any anomalies and make corrections. Campbell said CGI has been paid about $112 million of a multiyear contract that includes system development, maintenance and support valued at $290 million. "I know that the experience has been a difficult experience," Campbell said in response to a question from Rep. Henry Waxman (D-Calif.), the panel's senior Democrat and a key author of the Patient Protection and Affordable Care Act. "The system is working. People are enrolling. But people will be able to enroll at a faster pace; the experience will be improved as they go forward and people will be able to enroll by the Dec. 15 timeframe." The site interacts with 4,400 health plans in 36 states, according to Campbell. Under the ACA, nearly all Americans must have health insurance as of Jan. 1, though the Obama administration indicated Wednesday that it would allow people to sign up for coverage until March 31 and give them a grace period on the tax penalty for not getting coverage. Earlier, Committee Chairman Fred Upton (R-Mich.) said top administrators and lead contractors for months had assured the committee that everything was on track, "except, as we know well, it wasn't." Upton, who like other House Republicans opposes the ACA, added that Thursday's hearing was not about blame but rather accountability, transparency and fairness for the American public. He also looked ahead to what he sees as other potential problems. "This is more that a website problem—and, frankly, the website should have been the easy part," Upton said. "I'm concerned about what happens next. Will enrollment glitches become provider payment glitches? Will patients show up at their doctor's office or hospital to be told maybe they aren't covered or even in the system?" Democrats on the panel expressed concern that Republicans are using the hearing as yet another attempt to dismantle the healthcare reform law. Rep. Frank Pallone (D-N.J.) said the goal for all lawmakers regarding the federal website should be to "fix it, not nix it.” Waxman said Democrats want know what's wrong with the website and how they can help fix it. Waxman also alluded to calls for a delay in the law's individual mandate. "We welcome yesterday's announcement giving Americans more time to sign up for the insurance," Waxman said. "Everyone has a responsibility to get health insurance. We expect people to observe that responsibility, but I cannot see that anyone's going to be penalized under the law if they have not been able to buy health insurance during this time where they have not had access to the exchanges." Several Republican committee members pressed the witnesses hard, attempting to elicit details about what in hindsight appears to have been a fateful decision to require HealthCare.gov users to create an account before they could shop and compare health plans. 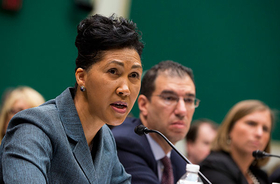 Campbell and Andrew Slavitt, group executive vice president of Optum/QSSI—whose firm, a subsidiary of health insurance giant UnitedHealth Group, produced two key components of the federal exchange—were the targets of most of the lawmakers' questions. Rep. Tim Murphy (R-Penn.) asked both Campbell and Slavitt who made the decision to put registration first, before consumers were allowed to browse plan options. Republican critics of the system have alleged the batting order decision was made so consumers would know whether they were eligible for federal premium tax credits before seeing rates, allegedly shielding them from “rate shock” if they first saw the full, unsubsidized premium. Campbell said she wasn't certain, but, “I would say Henry Chao,” made the decision. Chao is deputy CIO and deputy director of the Office of Information Services at the CMS. Several lawmakers pointed to apparent incongruities between testimony by Campbell and other HealthCare.gov developers at a Sept. 10 hearing, and even in their written testimonies submitted for the hearing today. In that testimony, each said their systems had been tested and were ready to go. Yet, when integrated and launched Oct. 1, they failed to work. But Walden then asked when the entire system was tested end-to-end to determine whether the component parts would work as a complete system. “It started in the last weeks of September,” Campbell said. “Ideally, it would have occurred before that,” Slavitt added. Waldren then asked what would be the industry standard. “Months would have been nice,” Slavitt said. Schakowski said HealthCare.gov is not fatally flawed. “Some people are getting through.” She read a note from a constituent named Susan, who said she was able to access the site yesterday, get coverage and save $5,000 a year with a plan from the same insurer carrier she has now. Rep. Adam Kinzinger (R.-Ill.) asked about error-ridden ASC X12 834s (essentially electronic transmission forms), in which one insurer got an 834 with three spouses listed on it. Campbell said, “We have uncovered a number of those scenarios, not significant, but a number, and we're in the process of making corrections. Most of them are isolated, more isolated than widespread. When that issue comes into the contact center, we get a trouble ticket, we look at CMS' prioritization of trouble tickets, implement our code changes and update our system.” Kinzinger also asked about reports that dependents are being coded as spouses, but Campbell said she was not directly aware of that problem. If she is able to provide information to the committee as to what problems exist with the 834s, she said she would do that.